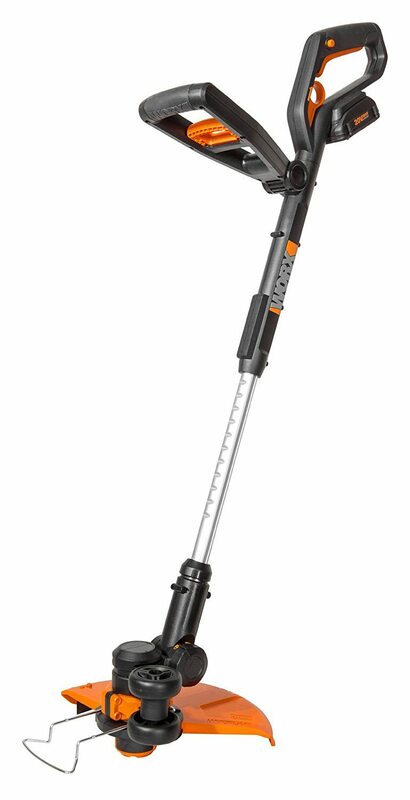 The WORX WG169E is a 20 volt cordless grass trimmer that is a highly rated buyer choice for many gardeners. 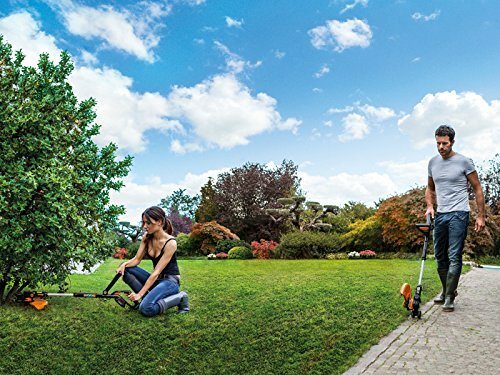 This trimmer can quickly convert to a wheeled-edger or mini-mower for your lawn in just seconds. It uses an automatic single line feed, has an adjustable telescopic shaft, and uses a high quality Lithium-Ion battery for power. The RRP for this trimmer is £109.99, however you can find this online at a cheaper price if you shop around. It costs on average around £105. As I mentioned, buyers do rate this model highly. On average online buyers have given this trimmer from the WORX brand an average satisfaction rating of 88% If you like the idea of cordless free strimming, then this is a very good choice. This is also a popular and well know tool and gardening brand. This one is ideal for those with medium to large sized gardens, and can easily deal with tough weeds, or long grass. It is also a convenient way of quickly doing the edges of your lawn. We found this very good review on YouTube, and we think it does an excellent job of explaining exactly how this strimmer works, and how effective it is. It is worth a couple of minutes of your time to give this video a quick watch, as it may help you decide if this is indeed the best option for your gardening needs. Buyer satisfaction is always a very good thing to check out when you are considering buying a product, especially if you are thinking about buying it online. This one has a solid rating and it has held that rating for quite a long time, and that is always a very good thing. When I checked all the online reviews from the many online suppliers, I noticed that 8 out of 10 buyers gave this one the full 5 star treatment. In terms of those who gave this trimmer a low rating, that was around 6% of all buyers. Buyers also said that this one was lightweight when compared to other trimmers that they had used in the past. The fact that it is cordless does make this one very useful for work at allotments or even graveyards. It comes with two batteries which is great. With both of those fully charged you will be able to get plenty of cutting time, and again that makes it ideal if you need to use it away from the home garden. Some buyers said that they moved from a petrol strimmer to this one as it was lighter. It is lighter, but do not expect to get the same cutting power as you would from a petrol strimmer. 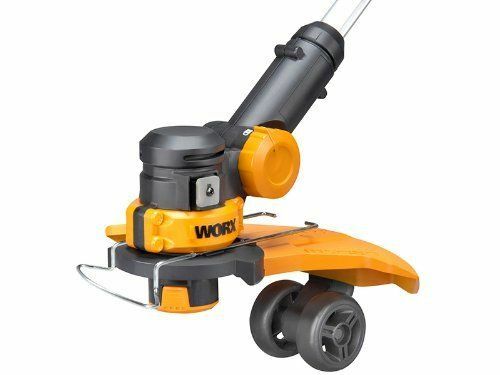 This WORX model is a great cutter, even on the heavy stuff, but it will not be as heavy duty, especially if you have been used to a petrol 2-stroke version for a long time. 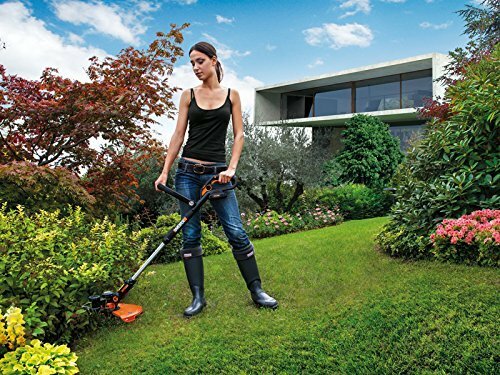 If this is not the right cordless strimmer for you, then click here to see our top rated list. There you will find a list of the top 10 trimmers currently available on the UK market. Clearly from the buyer reviews, this is a very high quality trimmer. At the full RRP, it is not a cheap purchase, but it is in our opinion, a very good option. Do check online though as you can usually find a better deal and offer. It works well as a trimmer and edger. We also think the mini mower features is really good for getting under tables, seats and benches. That is a pretty clever and relatively unique design and feature of this trimmer. All round at the £100 price point, and with high buyer reviews, we think this represents really good value for money. The brand is a good one and in terms of cutting power I found that its strength is not very far off a typical petrol machine, but a great deal quieter. Most online buyers said it did a very good job of edging. The wheels help a lot to get you a more even and neater finish. It comes with two batteries, and when you consider that, we have rated it slightly higher than online buyers in terms of value for money.